Wireless sensor networks (WSNs) can be typically used to achieve continuous monitoring (CM) or event detection inside the supervised area. In CM applications, each sensor node transmits periodically its sensed data to the sink node, while in event-detection driven (EDD) applications, once an event occurs, it is reported to the sink node. Hence, CM applications entail much higher energy consumption since all nodes are actively transmitting information much longer than typical EDD applications. Furthermore, in highly dense WSNs, the energy consumption is even higher. As such, the use of autonomous devices that provide a constant energy supply is becoming relevant for these environments. In this work, we propose to take advantage of the electromagnetic waves found in the radio-electric spectrum in order to supply the energy to each node in the network. To this end, the antenna and the storage and amplifications system for such device are designed. Additionally, the performance of dense CM WSN is studied using a Markov chain in order to calculate the lifetime of the system. Wireless sensor networks (WSNs) are typically designed for either continuous monitoring (CM) or event-detection driven (EDD) applications. EDD WSNs are deployed over a target area to supervise certain phenomena of interest. Once an event occurs, it is reported to the sink node by the sensors within the event area. Each node takes readings from the local environment and processes and transmits the sensed data to the sink node. In this type of WSNs, communications are only triggered by the occurrence of a pre-specified type of events. As opposed to EDD applications, CM WSNs are deployed in order to examine the evolution of certain parameters, which are refreshed periodically at the sink node. As such, CM applications have typically much higher energy. Energy consumption is a major issue in WSNs (for both EDD and CM applications) since in many cases it is very complicated to replace the node's batteries or even impossible. Consider for example, the case of a WSN deployed in the forest for animal protection purposes  or inside the concrete in buildings or steel beams in bridges in order to monitor the structural health . 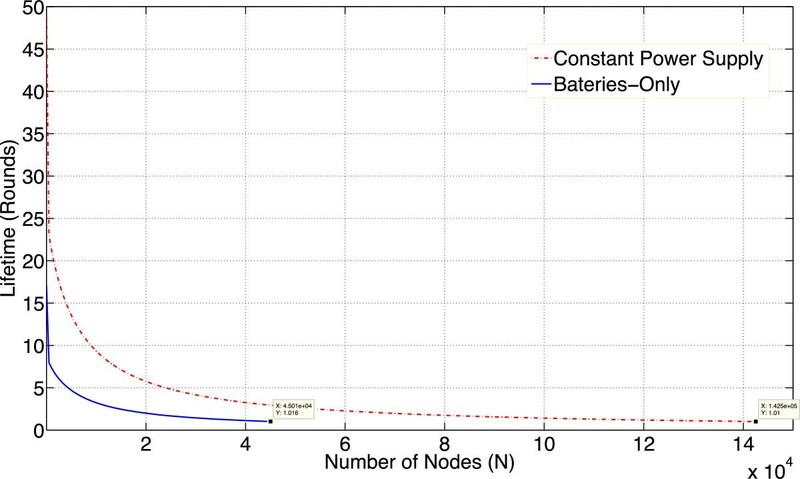 In the literature, it is common to assume that nodes are equipped with batteries, which power the nodes for a limited amount of time . Hence, the communication protocol is designed in order to limit the power consumption in the system. For instance, clustering protocols like the one proposed in  aim at reducing and evenly distributing the energy consumption in order to extend the network's lifetime. Building on this, it is natural to search for alternatives to constantly supply power to the nodes in order to extend the network lifetime or even avoid complete energy depletion. Emerging technologies such as solar cells can be used for such effect with the main drawback that it cannot work efficiently indoors or at night. Another alternative would be the use of devices that take the energy from the electromagnetic waves in the radio-electric frequency spectrum, such as TV and radio signals. This alternative has the big advantage that, in these frequencies, there are almost always data transmissions for where to extract energy. In this case, the proposed device is not designed to decode these signals, just to take advantage of the ever-present signal transmission in this frequency range. In this work we focus on the later alternative. To this end, we design both the antenna to receive electromagnetic waves in a wide frequency range that comprises radio and TV signals as well as the storage and amplification systems that provide a constant power supply to the nodes in the network. Figure 1 shows the proposed energy-harvesting system. An incident power of the electromagnetic waves is absorbed by the effective area of the antenna and passes through a transmission line to reach a voltage multiplier. Then the peak output voltage is increased four times the peak input voltage. The output of this stage corresponds to an alternating current (AC) quantity. 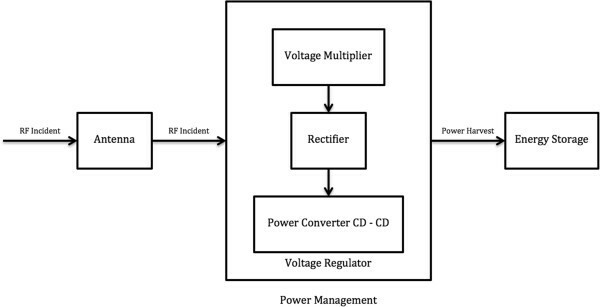 Hence, the voltage multiplier output has to be processed by a power converter to produce a suitable direct current (DC) output voltage to meet the requirements of the application. Hence, the received power is rectified to eliminate AC components. As an additional feature of our work, we develop a mathematical analysis to determine the performance of a CM WSN when such device is used, i.e., when nodes use a constant power supply. We focus our attention in CM WSNs since these applications are more energy consuming than their EDD WSNs counterpart. From the numerical results obtained in this work, it is clear that the use of a constant power supply, such as the device proposed in this paper, can radically change the analysis and design of WSNs. Indeed, the design of WSNs is mainly focused on the lifetime of the system when a limited-energy battery is used as means of power supply. Specifically, communication protocols (including random access strategies and routing schemes) are mainly designed in order to limit the amount of transmissions. This leads to a very restrictive environment where only the most relevant data is to be transmitted. Conversely, when each node has a constant power supply, the design can now be focused on other parameters such as delay guarantees in multimedia data transmission, such as video surveillance or video transmission and VoIP-enabled sensors for noise detection. A similar RF energy-harvesting device was presented in . However, in  only a 2.4-GHz frequency was considered. In this work a range of frequencies (from some megahertz to a few gigahertz) are contemplated in order to harvest the maximum amount of energy from different radio sources. Also, the work in  does not present a performance evaluation of a WSN with a constant energy source since its focus is mainly on the electronic device for general purpose. In this line, in [6, 7] an alternating current/direct current (AC/DC) converter from an AC voltage of a few hundred millivolts is developed. In the work presented in , authors consider the use of a low-voltage AC/DC converter system for the particular case of a WSN. From the developed systems in [6, 7], it is clear that their proposed devices can indeed offer a constant power supply to the nodes in the system. However, both [6, 7] focuses mainly on the AC/DC conversion. Hence, neither antenna design is proposed nor the performance analysis of the WSN is considered. In the rest of the paper, we develop the antenna design in order to harvest energy in a wide range of frequencies. Then the electronic device that converts the very low AC signal to a 3.5-V DC signal is presented along with the storage system. Finally, the performance analysis of a continuous monitoring WSN when nodes have a constant power supply is shown. We conclude the paper with some remarks and future work ideas. In this section, the antenna design and the voltage multiplier are presented. As a case of study, it is considered that the WSN is deployed at a distance of 15 km from the radio and TV broadcast emissions. Also, a performance analysis of the proposed device in a WSN for continuous monitoring applications is presented. In order to take advantage of the ever-present signals in the radio and TV frequency spectrum, an antenna with a wide bandwidth is required. As such, a spiral antenna was selected. In Figure 2 we present the architecture of such antenna. Since the system was designed to operate in Mexico City, the following frequencies are selected: radio services in the range of 88 to 108 MHz with a received power of -37 dBm in average; TV services in the range of 170 to 700 MHz with a receive power of -24 dBm in average, as well as the range of 2.4 to 2.4835 that corresponds to the WLAN (WiFi) services which are experimenting an important growth in Mexico City. 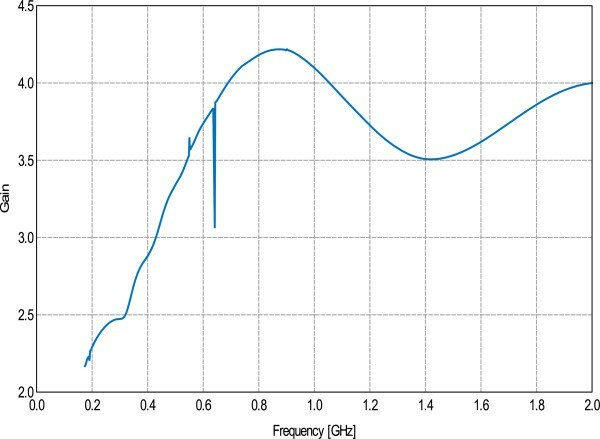 It can be seen in Figure 3 that in these selected frequencies, the antenna has an acceptable gain with small variations. In Figures 4 and 5, we show the radiation pattern for different angles of the antenna, which is stable and high for different frequencies, specifically in the frequency range of interest. Radiation pattern at 0° (dBs). 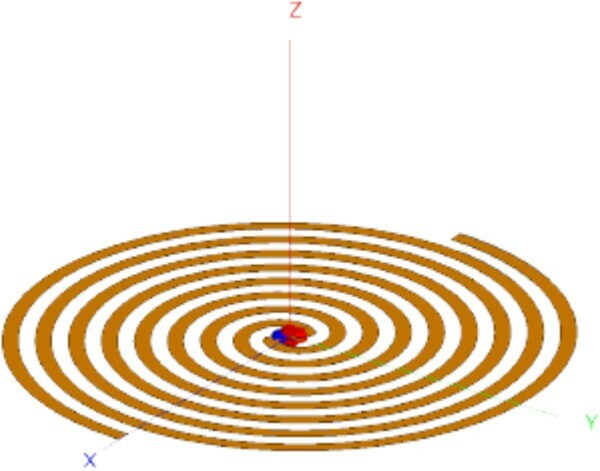 Radiation pattern at 90° (dBs). One main reason for the antenna selection is its input impedance response which is also very stable in the operation range (300 MHz to 3 GHz). This implies a good coupling with the receptor. This is the main reason to use this type of antenna. 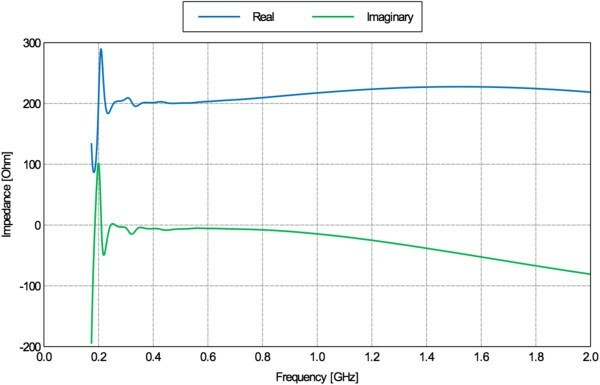 Indeed, many other antennas were investigated, but the input impedance of a spiral antenna is predominantly real over a wide bandwidth (Figure 6) . Antenna impedance (ohms) for the selected frequency range. 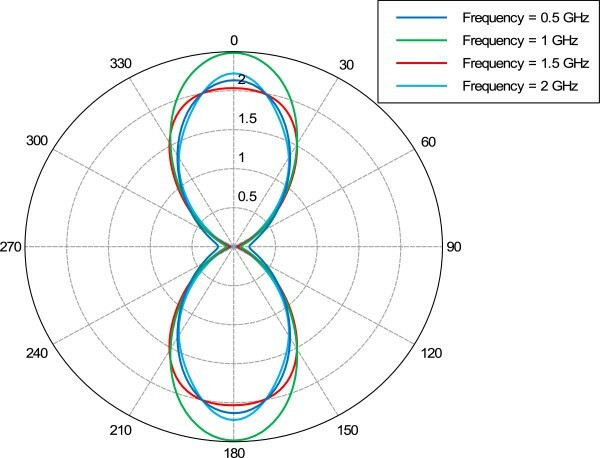 The spiral antenna can be used over a wide range of RF incident power densities, where the goal for the power management is to optimally load the rectenna at the DC output to achieve maximum harvested power . The spiral antenna can be connected to switch with reconfigurable rectenna circuit. The characteristic of the antenna was simulated with FEKO software. The RF input energy is rectified using a rectenna circuit. The circuit is optimized for a given input RF power. The principal limitation of the rectenna circuit is that it is designed for an operating point. Good efficiency is obtained when different parameters are considered: power level, central frequency, and load impedance . A rectenna is a microwave rectifier which converts RF energy directly into DC current. When only one frequency is considered, it is possible to use a high-gain receiving antenna. In this section, the electronic design for the voltage multiplier is presented. This system is shown in Figure 7. General storage and amplification system. The antenna is considered to be an AC voltage source as seen in Figure 8a. It is then connected to the storage and amplification system via a transmission line with an impendence of 50Ω. Then, the signal enters to an amplification phase that increases the amplitude of the signal four times the value received at the antenna. 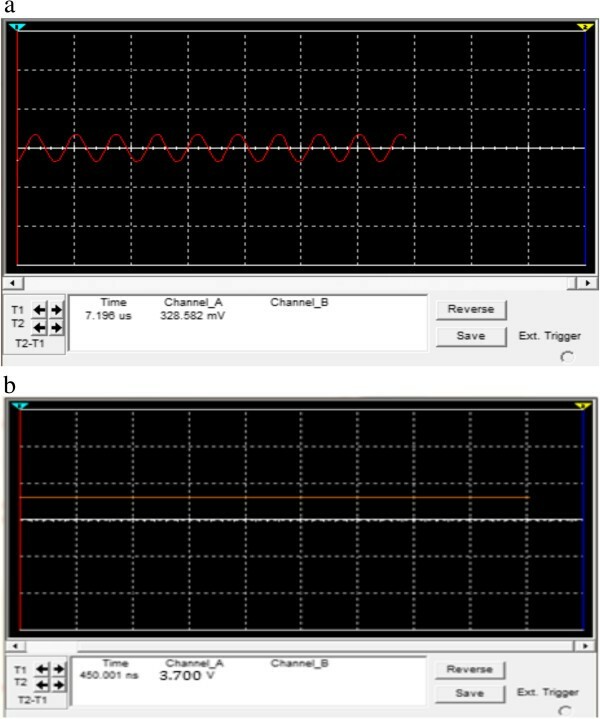 Finally, at the end of Figure 7, a rectification system is used in order to have a DC signal with a constant value of 3.5 V, as seen in Figure 8b. Input (a) and output (b) signals from the storage and amplification stage. In this section, the advantages of using a device that delivers a constant power supply to each sensor node are studied. It has been proven in  that the use of a clustered-based architecture greatly reduces the energy consumption in CM WSNs since the main sources of energy wastage are addressed: collisions, overhearing (when a node receives an unintended packet), idle listening (lost energy while listening to the medium to receive possible traffic that is not sent), and overhead (due to exchange of signaling messages required for the protocol execution). Hence, we assume such architecture in this analysis. In a clustered-based network, like LEACH , two distinct phases compose the normal operation: cluster formation (CF) and steady state as shown in Figure 9. In the CF phase, nodes transmit to the rest of the nodes using a random access protocol such as slotted CSMA-NP, while in the steady-state phase (when clusters are already formed, a cluster head is selected for each cluster and the cluster members are well identified), a collision-free protocol can be used such as a TDMA-based structure. Since the role of the cluster head (CH) is more energy consuming than the operation of the cluster members (CMs) (due to the data recollection and transmissions to the sink), the function of the CH has to be periodically interchanged in order to avoid premature energy depletion of a node. The time period that comprises the CF and the steady state (with multiple TDMA frames) is known as a round. As such, the energy consumption in a CM WSN has to consider both phases. Multiple reports are transmitted inside a round, where CMs send their information to the CHs in their specific time slot. When all the CMs have transmitted to the CH, the CH sends this information to the sink node also in a specific time slot. Specifically, we are interested on studying the system's performance in terms of the number of nodes that causes the energy depletion of a given node before the end of a round. Indeed, when the number of nodes is small and when a constant power supply is used, none of the nodes in the network consumes all of its energy. This is because both the CF and steady-state phases do not require the use of more energy than the one delivered by the proposed device. In such case, the analysis is straightforward since nodes never consume all their energy. Conversely, when the number of nodes is high, the number of collisions and the time spent in idle listening and overhearing is considerable. As such, it is likely that some nodes may deplete their energy before a round is finished. This is a very undesirable behavior in a WSN since the premature energy depletion of a node implies a loss of information. Building on this, we focus our analysis to find the number of nodes that produces information loss in a WSN when the constant power supply is both used and not used. Data transmission in cluster-based WSNs. The following parameters are used for the analysis: The WSN is considered to be placed at 15 km from the emitting antenna. In such conditions, the constant power supply is 3.5 V. The control packets used for the CF phase is lCF = 80 b, while the data packets used in the steady phase is ld = 2,048 b. Based on commercial transceivers (Microchip MRF24J40, Microchip Technology Inc, Chandler, AZ, USA), the transmission energy per bit is ETx = 0.395 J while the reception energy per bit is ERx = 82.5 mJ. Also the energy of a conventional lithium battery is 7.59 J. 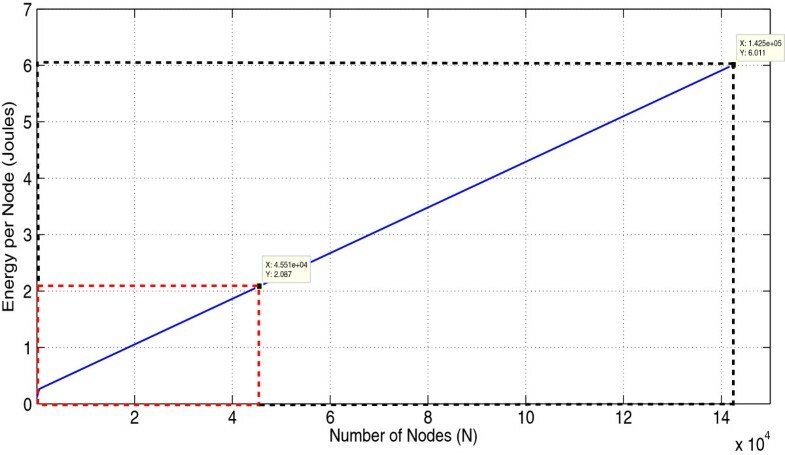 For a WSN with N nodes and C clusters in average, there are ENC = N/C nodes per cluster. where ld is the data packet length used for the transmission of the recollected data by each node, and R is the number of TDMA frames per round. Note that from the N/C nodes in average that form the cluster, only the cluster members transmit to the CH (this comprises the first two elements of (1)). Also, the CH transmits all the recollected packets to the sink node, including its own data packet. As such, neither data compression nor aggregation is assumed in this analysis. Also, it is considered that the same transmission energy is used to reach the CH and the sink node. The rationale behind this is that the analysis presented in this work is a first attempt at analyzing the performance of a WSN with a constant power supply. To this end, we consider the worst conditions. The effect of data compression and/or aggregation would render less energy consumption. Now we focus on the cluster formation phase. 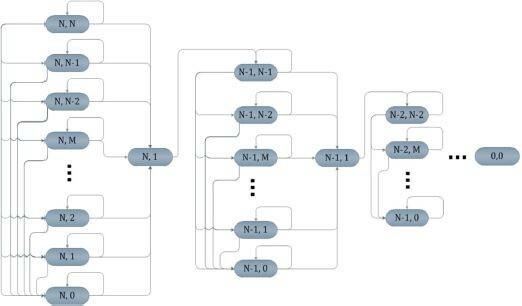 This process can be modeled by a two-dimensional transitory Markov chain with states (n,m) where n (0 ≤ n ≤ N) corresponds to the number of nodes attempting to transmit their control packet while m (0 ≤ m ≤ n) is the number of transmissions in a given slot as depicted in Figure 10. Markov chain for the cluster formation phase. The system begins in state (N,0) and state (0,0) is an absorbing state (in this state all the nodes in the system have successfully transmitted their control packet and the clusters are formed). where τ is the transmission probability given by the geometric backoff assumed in this work. When the chain enters state (n,1) (one node form the n contending nodes), it goes to state (n-1,l) with probability 1/(n-1).As such, this two-dimensional Markov chain can be considered to be composed of N different phases denoted by the number of nodes attempting a packet transmission. Hence, the energy cxonsumption at phase n can be calculated noting that whenever a successful transmission occurs, there is one node that consumes E Rx CF = E Tx l CF units of energy, while there are n-1 nodes that receive the packet, each consuming E Rx CF = E Rx l CF units of energy. Hence, the energy consumption in the case of a successful transmission is E Tx CF + n - 1 E Rx . On the other hand, whenever a collision occurs or if there are no transmissions, there are S n nodes that transmit, each one consuming E Tx CF units of energy, while n-S n nodes listen to the channel consuming E Rx CF units of energy each one. C nm , kl = l E Rx CF + n - l E Rx CF . C nm = ∑ l = 0 n C nm , kl P nm , kl . Hence, the average energy consumption at the cluster formation phase is ECN 0. In Figure 11, the total energy consumption per node and per round is presented with R = 1. In Figure 11, two rectangles are shown. In the red one, we show the operation range of a WSN where nodes are powered by a conventional battery. In the black rectangle, the operation range of a WSN with a constant power supply, such as the one proposed in this work, is shown. It can be seen that as the number of nodes in the system increases, also the energy consumption in the CF phase increases due to the number of collisions, idle listening, and overhearing. Also, in the steady state, the energy consumption increases since there are more nodes reporting its information to the CH. As such, CHs consume much more energy in order to transmit the gathered data to the sink node. It can be seen that without the proposed device, the system only support 40,000 nodes without a node depleting its energy before the first round is over. On the other hand, when the device is used, the system supports 140,000 nodes before a node depletes its energy before the first round is over, which corresponds to an increase of 10 times the number of nodes supported in the highly dense WSN. Total average energy consumption per node in a round for different number of nodes in the system. Figure 12 shows the lifetime of the system for different number of nodes in the network. The cases where nodes are powered only with batteries and when a constant power source is used are presented. Whenever the number of nodes is small, the lifetime of the system is high since there is a low energy consumption. However, as the number of nodes increases, the system's lifetime decreases rapidly. However, for any number of nodes, the system's lifetime is always much higher when a constant power source is used. This result justifies the use of such a device in any environment. System lifetime for different number of nodes in the network. In this paper an electronic device to use the energy from the electromagnetic waves was designed. First, the main radio emissions in the particular case of Mexico City were studied in terms of frequency and RF power reception. Then, a suitable antenna was designed such that it is capable of absorbing most of the available radio emissions ranging from dozens of megahertz to a few gigahertz. Given this wide range of frequencies of interest, it can be connected to switch with reconfigurable rectenna circuit. As such, a spiral antenna was selected given its good coupling characteristics in practical all the frequency range. Then, the electronic system was designed. This circuit is composed of the AC/DC converter, rectifier, amplification, and a storage system that directly powers each sensor node. Building on this, a mathematical analysis to calculate the energy consumption in a CM WSN was performed. First, the analysis considered that a limited energy battery powered the nodes in the system. This is the conventional case in the WSN environment. Then, the analysis was performed considering a constant power supply of 3.5 V. Hence, whenever the energy consumption for the continuous monitoring application entails an energy consumption of less than 3.5 V per node, the system can operate without suffering any depletion from the nodes. Conversely, when the energy consumption is higher than this value, some nodes stop operating, causing information losses. This simple analysis proves the benefits of the proposed device in the context of WSNs increasing by 10 the number of nodes supported in the system without a node depleting its energy in the first round. 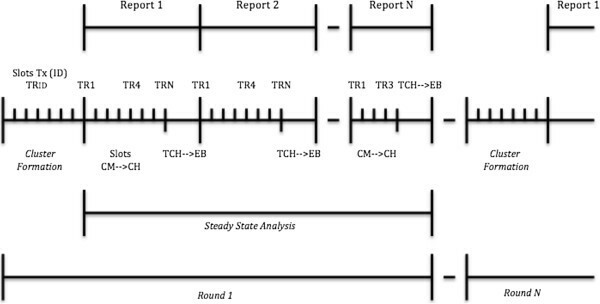 The analysis can be further improved by considering multiple TDMA frames per round as well as compression and aggregation techniques. Also, different transmission ranges can be considered in order to further reduce the energy consumption. This work was partially supported by the National Polytechnique Institute (UPIITA-IPN) under multidisciplinary project SIP 20130440 and CONACyT-SEP project 183370.